In February this year, we called Google Home Max the best smart speaker for the money, period. Our position hasn’t wavered. For around $400, the speaker is the best combination of elements in its price range. It lacks the audiophile-quality sound of Sonos, and the form factor of the HomePod, but for all intents and purposes, it’s the best combination of both on the market. Options, though, are plentiful. And my one complaint about Home Max is that a speaker of this size can’t serve double duty as a sound bar, or even stereo speakers for your home entertainment center, without some rather unreliable hacks. 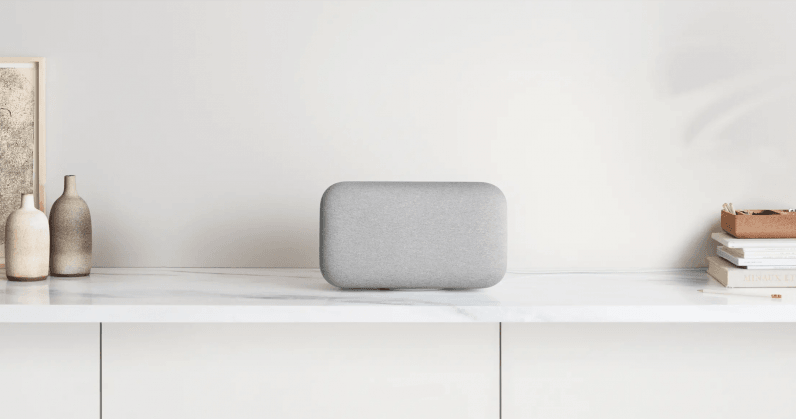 And most of those, unfortunately, have real issues with latency that make it all but unusable as anything other than what Google intended it to be: a smart speaker that sounds great when playing music. It’s a disappointment, but not enough to keep me from recommending it. Fingers crossed we’ll see an update in the future that could find the device moonlighting as something with sound bar-like functionality. Today, at Google I/O, company representatives revealed to TNW it would be addressing this issue, kinda. It’s not that you can’t use Home Max as a sound bar, it’s just that it requires a bit of hacking to sync audio and video, and requires a separate receiver. In short, you really need something that allows you to tweak the audio speed with the video in order to try to line the two up perfectly. It’s not easy. But by the end of the month, Google will begin rolling out a performance update that will reduce line-in delay (latency) from 550 to 39 milliseconds. The update will create a mostly seamless listening experience to anyone who may be listening to our favorite smart speaker through a plugged in device, whether that’s a record player, phone, or yes, even your television. Still, it’s worth noting that this isn’t what Home Max was intended to be. Here, Google responded to a common gripe. Why shell out $400 for the Home Max only to sacrifice shelf space for the rather large device while requiring even more shelf space (and money) for a separate device (or devices) to control the audio needs not covered by Google? For about $100 more, after all, you could cop a Sonos Play:5, a speaker without the AI wizardry of Home Max, but one that features slightly better sound and (arguably) a few more bells and whistles — most notably, the ability to play audio from your TV without the same latency issues. Luckily, I have a bit of space in my living room. Home Max managed to coexist with my “other” speaker system, the one that mainly exists just to play audio from my TV. And while Max will never pump out the same premium sound as a set of quality speakers, it’s good to know that — if forced to move into a place where space is an issue — I wouldn’t need both.